Our Lancaster County, Pennsylvania Craftsmen combine outdoor lumber with modern components and craftsmanship to make your set a child’s delight. A catalog is available to show the most popular and standard designs. A variety of components are available for you to choose from. At Nature's Cover it is our mission to provide homeowners and contractors with everything but plants to enhance their property. We offer the unique opportunity to shop the product before purchase. Nature's Cover strives to maintain the highest level of integrity and knowledgeable service in the profession. 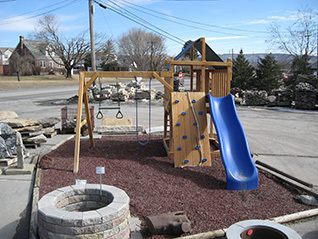 We have the largest selections of landscape products in Centre County. Call us with any questions you may have. Or better yet, stop by and visit us!!!! Contact us for the current delivery fees to your specific area. Customers will be respected and served as Royalty. Some items able to be returned. Must have original receipt, and a restocking fee will apply. $25.00 returned check fee plus court costs. Before starting project, inquire about availability.